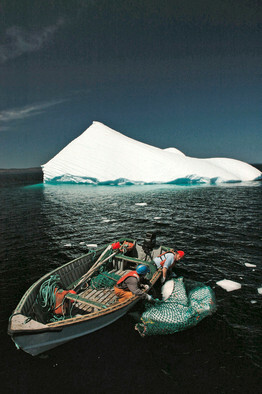 Ed Kean has been harvesting ice bergs off the northern coast of Newfoundland, Canada for many years. Every summer, Mr. Kean, a 53-year-old, fifth-generation sea captain, heads out into the North Atlantic to capture chunks of icebergs that have cleaved off Greenland glaciers and floated southwest. He harvests the ice for a local vodka maker, a brewer, a winery and a bottled-water outfit. The companies use the water, which has been trapped in glaciers for thousands of years, in their products, marketing it as the purest on the planet. Demand is growing, the companies say, but getting the prized ice is becoming more difficult. The process at sea includes massive nets, a giant, ship-mounted hydraulic arm and, sometimes, a rifle and chain saw. Mr. Kean now also has to contend with erratic iceberg drifts, increasing fuel costs and some tourist outfits that complain he is chipping away at their iceberg-sighting business.